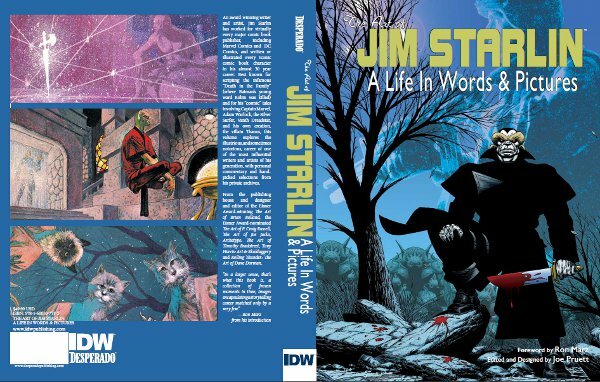 I recently wrote the foreword for The Art of Jim Starlin: A Life in Words & Pictures, which is being published by Desperado, through its partnership with IDW. It’s a whopper, checking in at 328 pages, filled with Starlin art both familiar and previously unseen. Jim’s the one who asked me to provide the foreword, and I was pleased and honored to do so. The rest of the text is by Jim himself, presenting an honest account of his life and career, with no punches pulled. So it’s not merely an art book. It’s a pretty fascinating read, with the kind of behind-the-scenes tales everybody craves. One of the previously unseen pieces is the one you see below. 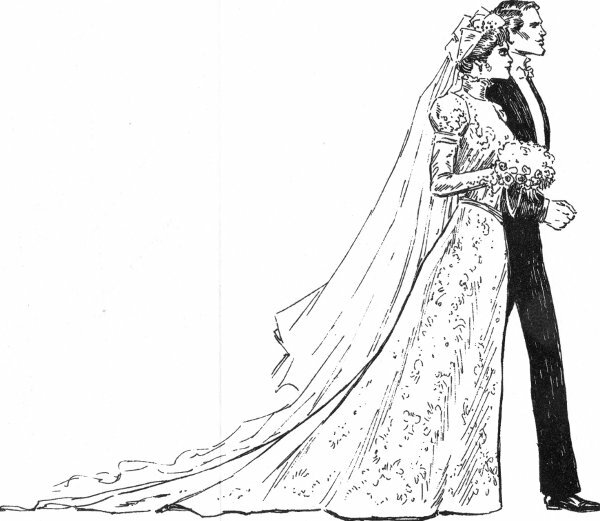 This is the piece Jim did a number of years ago for my wedding invitation, a piece inspired by the great illustrator Charles Dana Gibson. I’m guessing not too many people can say they had a Jim Starlin original as their wedding invite. Desperado publisher Joe Pruett was kind enough to allow me to reprint the complete foreword here. The book should be in stores at the end of September, priced at $49.99 for the regular edition (featuring a Breed cover) and $79.99 for the limited signed/numbered edition of 250 copies (featuring a Dreadstar cover). Definitely worth the price, hope you pick it up. That’s how Jim Starlin described sequential storytelling to me when he was showing me the ropes of writing a comic. In a larger sense, that’s what this book is, a collection of frozen moments in time, images encapsulating a storytelling career matched only by a very few. Most art books are just that: a collection of images that chronicle an artistic career. But there’s more than that here. These images are in service of the stories Jim Starlin has told over four decades, things like Warlock and The Death of Captain Marvel and Dreadstar and many more, stories that are inimitably “Starlin” in both concept and execution. I’m pretty sure my first exposure to Jim’s work was the classic end to his first Warlock saga, Avengers Annual #7 and Marvel Two-in-One Annual #2. In 1977, I didn’t even know that such things as comic shops existed. I was a spinner-rack kid, haunting supermarkets and convenience stores for whatever gems they might hold. Distribution was spotty, so getting my hands on consecutive issues of anything wasn’t always a guarantee. But I was lucky enough to end up with both the Avengers Annual and Marvel Two-in-One Annual, and they made a hell of an impression on me. That story was certainly one of things that fired my imagination and made me want to tell stories. There are still images from those issues indelibly imprinted in my mind: Thanos yanking Pip the Troll off the ground by his arm; the Avengers leaping down into battle, directly at the reader; Ben Grimm swallowing his cigar when he’s spooked by Spider-man. More than anything, though, I remember what happened: our hero, Adam Warlock, died. And then he came back from the afterlife and turned Thanos to stone. What’s more … I even felt kind of bad for the villain. This was stuff that just didn’t happen in comics. This was something different. 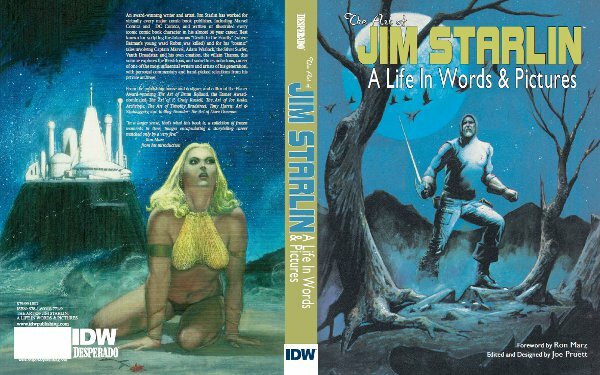 This volume absolutely shows “something different” is a hallmark of Jim’s career, as both an artist and a writer. Pushing boundaries, in both content (since when did superheroes die of cancer?) and form (fully-painted pages, embracing the digital revolution, even switching to prose novels). We all owe Jim a debt for being the iconoclast he is. All comics pros owe Jim a debt for essentially hammering out the incentive agreement in comics that allows us to share in the publishing success of our work and make a comfortable living. And I personally owe Jim for my career. Jim was the one who took me by the hand and led me into comics. I won’t belabor this foreword by recounting the whole tale again. Suffice to say that my life would be very different had I never met Jim Starlin. Very different, and likely not for the better. One time Jim asked me, “Are you ever sorry I got you into this?” He meant writing comics, living the life of a freelancer. Of course I told him no, that I wouldn’t trade it for anything. But he just as well could have meant blowing my 11-year-old mind with those two long-ago Annuals, and setting me on the unlikely path of becoming a writer, and being able to count Jim Starlin among my closest friends. I said this was a book of images in service of stories. But not just the stories of heroes and villains that Jim has served up so magnificently over his career. These images also serve to spawn our stories: our memories of where and when we first encountered them, what they meant to us then, and the lasting effect they have on us now. That’s the mark of a true artist, in every sense of the word. Blog posts are apt to be in short supply this week, unfortunately, in the run-up to the San Diego Comic Con and the release of Artifacts #1. I’ll be posting my signing and panel schedule for the con, but most of the other words this week will be in the service of stockpiling scripts. So in the meantime, here’s a couple links to keep you entertained. Both are from the Heavy.com site, which seems to be a something of an online lad magazine, with bikinis, mixed martial arts … and Liquid Comics. Not really sure how that came about, but the site is offering up a couple of my projects for Liquid (then Virgin) for free. I tried to pair characters with matching artistic sensibilities (frankly, something writers and/or editors should be doing all the time). Mike’s affection for heroic mythology made him a natural fit for Rama … and his rep for turning around pages fast didn’t hurt either. Jim’s career is obviously filled with memorable villains, his creation Thanos chief among them, so the villainous Ravan was an obvious choice. Luke’s beautiful, flowing lines and attention to detail were a nice match for Seeta. Luke did some gorgeous, full-color covers for Virgin’s Devi, a title featuring a female lead. That’s also Luke’s cover you’ll see on Beyond #1. I was a little hesitant to typecast David, who is best known for his terrific Mouse Guard series. But pairing David with the monkey-god Hanuman was too perfect to pass up. And finally, Bart’s penchant for muscled warriors and bloody battles made the Lakshman assignment an easy one. All five of the origin stories are collected here. Thursday I was able to attend a lunch that gathered a lot of the comic pros who live within an hour’s drive or so. Doing the job we do, most of spend a lot of hours at home, without the kind of social interaction that most people with, uh, real jobs take for granted. So the chance to get together and swap stories is a welcome one. 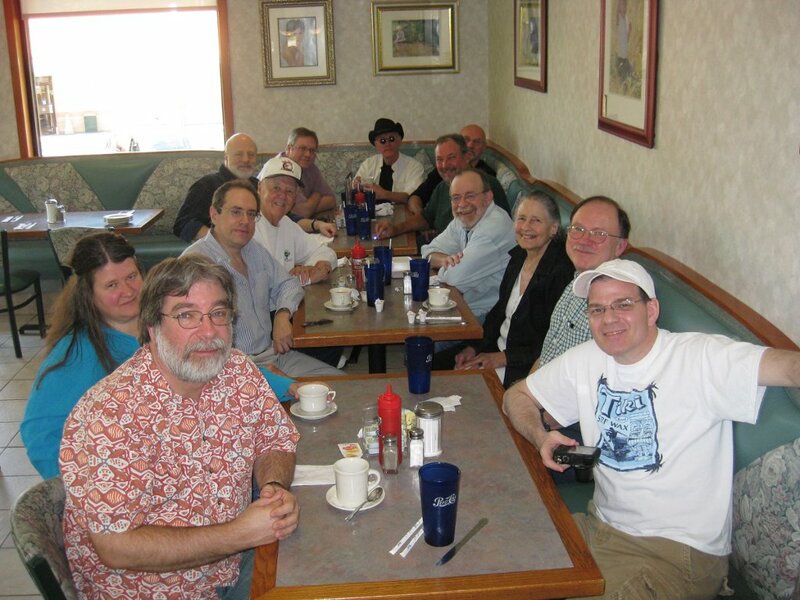 I was the relative young punk at the table, with only two decades in comics under my belt. Clockwise from bottom left in the photo: cartoonist Fred Hembeck; Fred’s wife Lynn Moss; inker Bob Wiacek; legendary Kirby/FF inker Joe Sinnott; inker Terry Austin; me; inker Dan Green (in cowboy hat and shades); that’s writer-artist Jim Starlin’s bald head peeking out; Mark Sinnott (Joe’s son); writer-artist Walter Simonson; Silver Age artist Ramona Fradon; penciler Joe Staton; and writer Todd Dezago. I’m fortunate enough to be able to call these people friends, and especially fortunate to be able to get together with them. We don’t do it often enough. I gave Walter a copy of Magdalena #1, the Ryan Sook cover of which was inspired by Walter’s iconic Thor #337 cover. Joe Sinnott shared some (literal) war stories. Starlin and I discussed the intro I’m going to write for his art book, which will be released by Desperado later this year. Fred revealed he’s going to be throwing out the first pitch at a Class A minor-league ballgame in July, and Fred, Mark and I commiserated about the Mets (as usual). Walter related some stories of teaching at the School of Visual Arts, and also told a tale of Jim Shooter having John Romita, Sr. redraw a Thor head on one of Walter’s covers, because Shooter deemed the original Thor head not handsome enough. Mark Gruenwald, the editor on Thor, waited until Shooter was out of the office, got Tom DeFalco to okay Walter’s original cover, and sent the book off to press. Grueny was a clever fellow. After a few hours, the gathering split up and everybody went their separate ways, most headed to their home studios to get back to work. But the afternoon was yet another reminder of how fortunate I am to be working in this business. 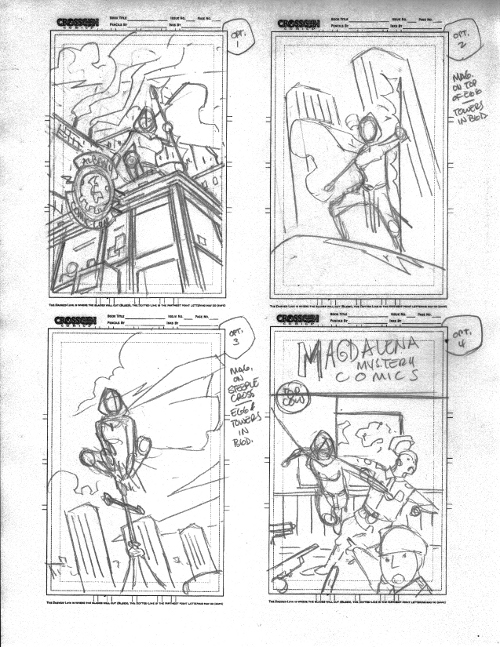 You’re looking at thumbnails –“thumbs” – for a variant Magdalena #1 cover. Now, I assume most people reading this blog would know that “thumbs,” or roughs, are small sketches. But I don’t want to assume everybody knows that. 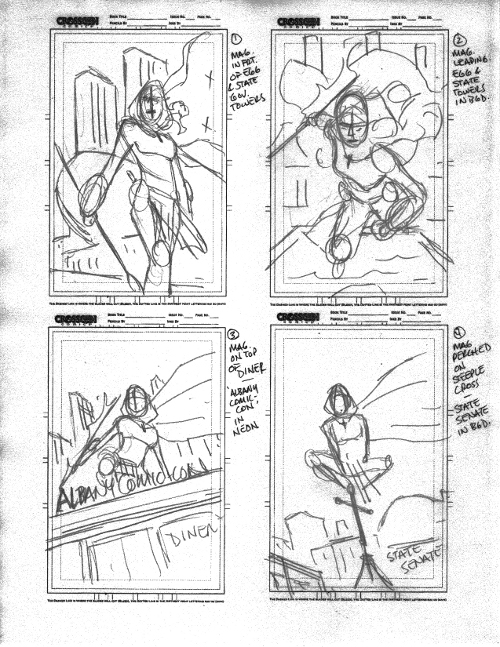 These roughs are by my buddy Matthew Dow Smith. The variant will be available at the Albany Comic Con, the “hometown” convention for both me and Matt, which will take place April 25. The show site is here. The guest list includes me and Matt, as well as a number of other Hudson Valley creators that have all been my friends for years: Terry Austin, Fred Hembeck, Todd Dezago and Joe Staton. Terry, Fred and Todd, along with Jim Starlin and Bernie Wrightson, were regulars are the weekly Woodstock volleyball matches I played in until our five-year Florida detour. Coming to the con from a bit farther afield are Lee Moder, my artistic partner on Dragon Prince and the work-in-progress Shinku, and Saurav Mohapatra, a writer I edited at Virgin Comics. Check out the entire guest list; it’s pretty impressive for a “local” one-day show. I’ve always been an admirer of Matt’s artwork, including Hellboy and Starman contributions and DC’s Day of Judgment series with an up-and-coming writer named Geoff Johns. Matt was my first choice when we needed a fill-in issue of my samurai-themed comic The Path at CrossGen. I thought his use of spot blacks would make him a good fit with the kind of work Bart Sears was doing on the series. Matt turned in a great job on his issue, and when Bart left the series, Matt moved to Florida to take over the regular art duties. We produced some issues I’m quite fond of, but it was destined to be unfinished business. Not quite a year later, CrossGen blew apart and Matt moved back to the Albany vicinity. A few years later, I settled in the same vicinity. 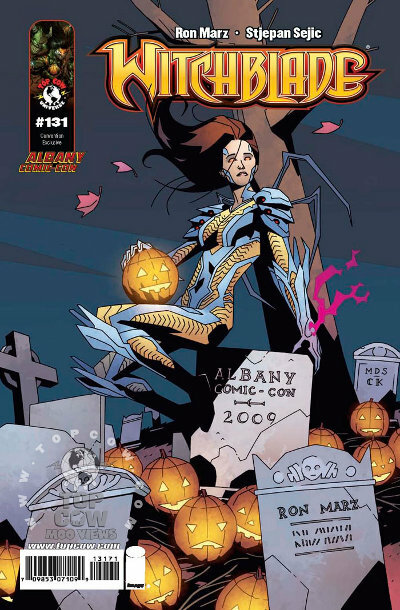 Matt’s first Albany variant, which he penciled and inked, was the Witchblade #131 cover for last year’s autumn con. The show was held the day after Halloween, so the subject matter was a natural. This time around, the obvious choice for a variant was my Magdalena series, which will debut just prior to the con. 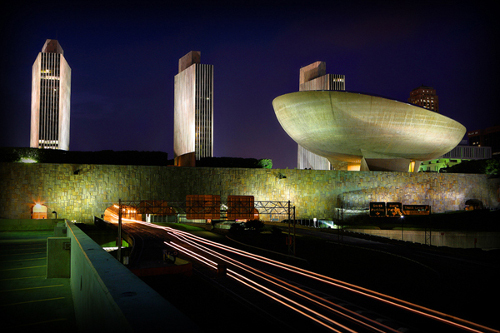 Without a natural theme this time, we discussed utilizing a background of the Albany skyline, featuring distinctive towers and an egg-shaped performing arts center. The towers feature in three of the four roughs from Matt’s first batch (above), including one I suggested featuring a trolley-car diner. Matt also included a shot of Magdalena perched atop a church cross, an iconic image that would also be a comfortable fit for Daredevil or maybe Spider-man. After input from con organizer John Belskis and Top Cow’s Filip Sablik and Phil Smith, Matt produced a second set of roughs (below). The diner concept was refined to include a neon sign featuring the Top Cow logo, and a peek at a couple of patrons inside that might well be Sara Pezzini of Witchblade and Jackie Estacado of The Darkness. The towers remained a background element in two of the roughs, but the lower angle on diner concept forced a different background for that image. Matt also added a shot inspired by look of golden age comic covers. So which one did we pick? Come back tomorrow to find out, and get a look at Matt’s finished pencils, which will be delivered to legendary X-Men inker Terry Austin for his distinctive contribution. I was actually planning a piece on the Hellboy: Weird Tales story I did with Jim Starlin, showing off some of the artwork in glorious black and white. 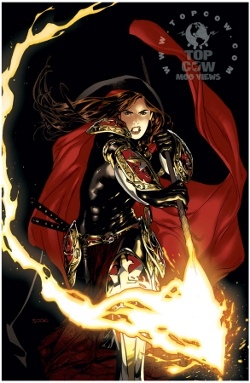 But that’ll have to wait until next week, because Newsarama popped up the entirety of my Magdalena story with Ryan Sook today, and I didn’t want to let it pass without comment. You can find the complete, 11-page story here. It’s one of my favorite things I’ve ever done, in large part thanks to Ryan’s amazing art and Dave McCaig’s perfect color. I remember talking to Ryan after the whole story was completed, and he raved about Dave’s color work, saying it the best interior color he’d ever received. I think Ryan is hands-down one of the best artists working in the business right now, so I was absolutely thrilled to have him on the story. And Dave was the perfect complement. Everything was spot-on. Sometimes all elements of a story and creative team just clicks, and you wind up with something special. Or at least special to me. The story appeared in the First Born: Aftermath issue, and while it put a coda on Magdalena’s involvement in that tale, it was really about her ongoing relationship with her “employers,” the Catholic Church; hence the title, “Crisis of Faith.” I think the story works pretty well as an appetizer for April’s Magdalena ongoing by me, penciler Nelson Blake 2nd, inker Sal Regla and that McCaig guy on colors again. Ryan Sook on covers, of course. 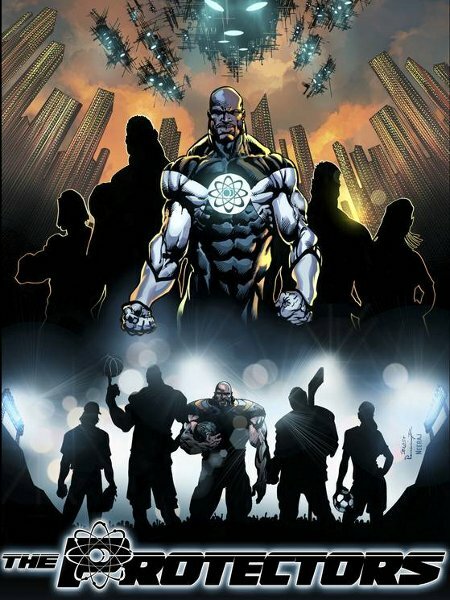 Story elements introduced in “Crisis of Faith” will surface again in the ongoing series. “Crisis of Faith” grabbed a Harvey Award nomination as Best Story or Best Issue or something. Didn’t win, of course. Not with All-Star Superman in the running. Still, nice to see the story get a little recognition. And nice to have it getting wider exposure on Newsarama now. If you like what you read there, I’d venture to say you’ll like the Magdalena series. Assuming you want to take that plunge, tell your retailer, so we can pump up those initial orders. Every sale counts in this market. You can also place an order with Discount Comic Book Service, which is doing a promotion with Magdalena #1, signed by me, for 99 cents. One more thing. It just so happens that today, about the same time “Crisis of Faith” was appearing for free, I was downloading “Love,” the new album from Angels & Airwaves, also for free. The band is offering up “Love” gratis – 11 new tracks. You can download it here. There’s a donation button on the site. You can give whatever amount you want, or just take the free album. I donated. Hope you will too. You wanna read something for free? If you happened to be checking out my Twitter stream earlier today, there was yet another discussion of pirating and illegally downloading comics. I won’t belabor the point here. Suffice to say that I’m wholly against downloading, and I’ve yet to see an argument for it that holds any water. If you want a comic, support the industry and pay for it. Or, if you’re just looking to read something for free, there are plenty of choices available. Even some by me. Last time I looked, Top Cow has various complete issues of my Witchblade run online, as well as the First Born #1 and number of other offerings. You can peruse them here. 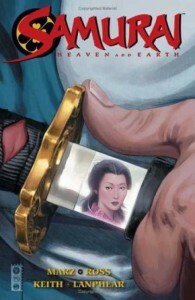 You can also check out an 8-page Samurai: Heaven and Earth story that appeared as part of the first Dark Horse Presents “issue” on MySpace. Dark Horse was looking for something a little more visceral to run with Joss Whedon and Fabio Moon’s Sugarshock, and Gerard Way and Gabriel Ba’s Umbrella Academy (not to mention a short Rick Geary story). A guy with a sword fit the bill, so artist Luke Ross, and I put together a brief, violent tale of our displaced samurai, Asukai Shiro. 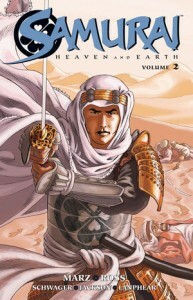 Samurai: Heaven and Earth is a creator-owned series by Luke and myself from Dark Horse, with two volumes in print thus far. It’s also absolutely my favorite project ever. The story follows a lone samurai who crosses the globe from East to West, following his kidnapped love, the lady Yoshiko. His travels bring him all the way to the halls of Versailles in Volume 1, where he meets some very familiar swordsmen. Volume 2 takes him to the sands of Egypt. I think the DHP short story, “The Forest,” stands on its own well enough. But chronologically it takes place between issues #2 and #3 of Volume 1, when Shiro begins his journey westward from China. At one point, I had toyed with the idea of a series of short stories, drawn by various artists, which would fill in the “untold tales” of Shiro’s journey. Luke is the artistic heart and soul of Samurai, but I’ve always liked “themed” anthologies, like Gaiman’s Sandman: Endless Nights or the Fables: 1001 Nights of Snowfall volume. Maybe that project will still happen at some point. But for now, “The Forest” is what you get, with beautiful art by Luke and colorist Dan Jackson. Thanks. In the future, I’ll be running some of the pin-ups that have appeared in the collected editions, pieces by buddies of Luke and mine, like Jim Starlin, Greg Land, Mike Deodato Jr., Cully Hamner, Lee Moder and plenty more.